Meditation is wrapped around misconceptions. 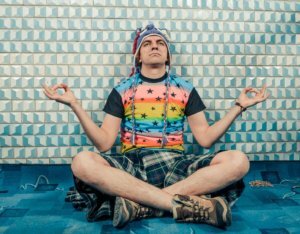 Some think it’s just woo-woo and while others dismiss meditation as an activity only for hippies and vegan yogis on a retreat in India. We’ve rounded up some favorite questions and statements from the most uncompromising of skeptics, and answered them in the most practical manner. No woo-woo, we promise. I don’t fancy sitting cross-legged chanting away, and don’t see how that can help me better my life? There are a number of ways to meditate, and many of them don’t involve chanting or even sitting cross-legged. Millions of ordinary people meditate every day sitting in a chair, focusing on their breath or using similar simple concentration exercises. Think of it as taking your brain to the gym. And, like going to the gym regularly, meditation has measurable benefits. A famous 2012 Harvard study demonstrated that just meditating like this for 20 minutes a day over a period of eight weeks resulted in improvements in brain health, reduction in stress levels, improved concentration and lowering of anxiety. It is true that many of the first people in the West to adopt meditation did so at the height of the hippy era, primarily because The Beatles adopted meditation in 1968 and introduced that generation to the practice. I count this as the PR coup of all time. But that hippy image of meditation is way out of date. Nowadays, your typical meditator could come from any sector of society. You can find meditation programs in schools, prisons, the military, corporations, even the British Parliament. Meditation is promoted as one of the keys to success by the heads of major corporations including Linked-In, Ford Motors, Salesforce, The Huffington Post, Aetna Insurance and many more. Because it works. Meditation has been repeatedly shown to enhance focus, productivity, engagement, creativity and innovation, and employee retention. From 2010 – 2012, Aetna Health Insurance conducted a two-year study amongst their own staff and concluded that their new voluntary wellness program, consisting of meditation, yoga and dietary advice, reduced negative stress outcomes and increased productivity, saving the company an estimated $63,000,000. And they didn’t even have to give up un-reformed coffee. Meditation is just a placebo effect you play on your mind, there’s no scientific proof behind it. The cool thing about placebos is that the science demonstrates that they actually work. The unresolved question is why. But meditation is not a placebo. It does not depend on your believing in it in order for it to have an effect. Modern brain monitoring technology has enabled researchers to measure the effects of meditation and now the jury is in. More than 1500 peer-reviewed studies support the long held claim that meditation has many lasting and beneficial effect on the brain, mind and body. It’s super boring to meditate. I lack patience and I am super easily bored. Yet I’ve been sitting for meditation every day for 2 – 3 hours for the last forty years, and I love it. And I am far from alone in this experience. The reason meditation, when it is working, is not boring is because it enables you to connect directly to your natural state of happiness. It effectively cuts out the middleman in the happiness transaction and goes straight to the supplier, which is inside you. It becomes a natural way of feeling really good, or getting high, if you like that idea. However, when you start out, before you begin to master the practice, it may feel boring. If you persist, you will naturally go beyond this as the meditation process begins to work for you. Meditation is just hype, it’ll die off since it’s useless. It is hard to think of a less likely scenario. Meditation has been with us for 7000 years at least, and right now its popularity is rising rapidly, not falling. The reason it is now becoming more widespread is because of the scientific research confirming it’s benefits. ABC news reader Dan Harris, author of10% Happier: How I Tamed the Voice in My Head, Reduced Stress Without Losing My Edge, and Found Self-Help That Actually Works–A True Story, started out as an extreme meditation skeptic. But his personal problems drove him to seek advice and his psychologist advised him to try meditation. The effect was so dramatic that Harris now predicts that within 5 – 10 years meditation will be recognized as an important part of a daily healthy routine, just like exercising and brushing your teeth. Meditation is not going away any time soon. I tried meditating for 5 minutes, but my mind wouldn’t shut up. This isn’t going to work for me. When I was a kid I wanted to learn to play the piano. But even at four years old I understood that it would probably take more than five minutes to achieve mastery. The same applies to learning a language, a sport or anything new. Like any discipline, meditation takes practice. Anyone who practices meditation regularly for long enough experiences a slowing down of their over-busy mind and a growing sense of inner peace. How long is long enough? As long as a piece of string. But in the Harvard study I mentioned earlier, benefits could be measured within eight weeks. I am not aware of any study on the effect of 5 minutes of meditation. What’s the point in sitting around doing nothing when I can use that time for something productive? Using this reasoning you would have to agree that physical exercise, or spending time with your family, or listening to music, is also a waste of time. But these are the things that help us to remain healthy, happy and fulfilled. Meditation is an important part of a healthy routine. It helps to increase emotional intelligence, concentration and has actually been shown to gradually raise your baseline of happiness, something that was considered by psychologists to be impossible until recently. That sounds pretty productive to me. You can use meditation to delete stress, unlock inner happiness and cultivate your creativity.